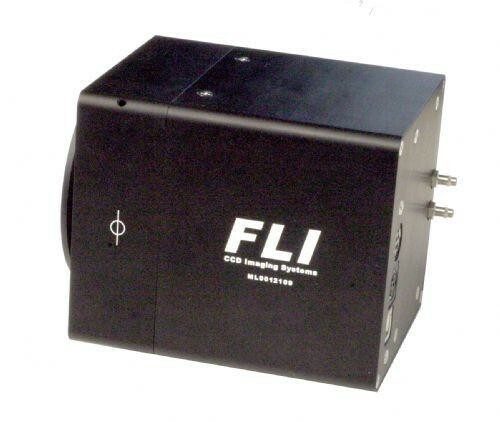 All FLI cameras incorporate a fan-assisted TEC (Peltier) that enables the camera to cool the sensor. Temperature reductions of up to 70?? ?C below ambient temperature are possible with the air cooled back. The actual cooling for any given camera will depend on the sensor size and ambient temperatures. The Liquid Cooled option typically improves upon cooling by an additional 5?? ?C to 10???C. The MicroLine Liquid Cooler has a flow rate range of 0.25 to .5 gallon/minute (.945 to 1.89 liter/min). Image shows a Microline camera (sold separately) with cooling option.